You are at:Home»Learn & Live the Faith»Catechesis»Does Quantum Mechanics Provide an Analogy for the Trinity? The priest who was guiding my catechesis used this illustration to clear up my confusion. As he explained it, the points of the triangle are distinct–as in three separate persons–but the triangle is one thing, God. That explanation satisfied me, and I used it myself when teaching RCIA and giving catechesis classes to inmates. And to enlighten me more, he used the following analogy: God the Father is God above us; God the Son is God beside us; God the Holy Spirit is God within us. Arguments from analogy have been criticized as being inductive rather than deductive and lacking substance, but I believe they are a valuable tool for understanding. I’d like to offer one more analog for the Trinity: the quantum mechanical superposed state of God the Father, God the Son and God the Spirt. I’ll not give here a detailed explanation of the relevant quantum mechanics. That has been discussed in more detail in another article of mine (Free Will and God’s Providence, Part IV) and in references contained therein. Rather, I’d like to explain why I believe there is an analogy, and what the theological import of this might mean. | state > = | slit 1 > + | slit 2 > , that is, the particle is going through BOTH slit 1 and slit 2 at the same time, as if it were a wave*. If we make a measurement to see if the particle has gone through slit 1, then the state is no longer a superposition but | state > = | slit 1 > ; likewise, if we make a measurement to see if the particle has gone through slit 2, we get | state > = | slit 2 > . Only if we make NO measurements to determine which slit the particle has gone through will we see the particle behave as a wave and give on a detection screen a diffraction pattern (with many particles striking the screen). | God, the Trinity> = | God, the Father > + | God, the Son > + | God, the Holy Spirit > . This is saying there is one God-state, God the Trinity which is the superposition–all three component states simultaneously–of the component states God, the Father, God the Son and God, the Holy Spirit. Now in quantum mechanics, the superposition is removed on measurement (either by collapse or by transfer to an alternate world/alternate mind–see Free Will and God’s Providence, Part IV) to yield the particular component state which the measurement was designed to detect. If we are to carry the analogy further, what would be the analog of a measurement to detect one of the component God-states? God the Father as the author of the Universe, of the laws of nature and mathematics, as Creator of all things, to worship and adore; we seek God in prayer (the “Our Father); we offer up to him the sacrifice of His Son in the Holy Mass. God the Son as our salvation, to help us spread His Word and Message, by speech and deed; we seek the the Son in Intercessions in the Liturgy of the Hours; we take him to ourselves in the Sacrament of Holy Communion; we seek his forgiveness, when in the Sacrament of Reconciliation we ask Him (in the person of a priest) to forgive our sins. God the Holy Spirit to change us, to alter our mind and heart to be better and approach the ideal given in Scripture. we seek the Holy Spirit in the Sacraments of Baptism and Confirmation; we ask His help when faced with moral dilemmas or avoiding sin. 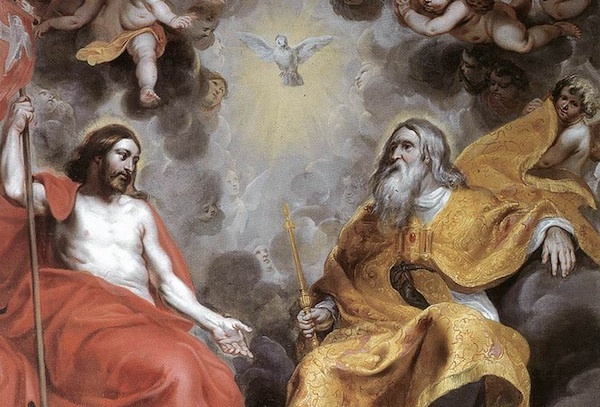 When we seek God in any of these modes, we reach to God as that person of the Trinity, we “decompose”, collapse the Trinity to the one sought for. When I started to write this article I thought it was an original idea. Doing a Google search on “the Trinity as a quantum superposition” I find there are many entries. I haven’t read these, in order that only my own fresh thoughts would be in the article. I’d be grateful for those with deeper theological knowledge to correct me in whatever I’ve said that may be contrary to doctrines or dogma of the Catholic Church.